Yesterday Mike and I enjoyed the beautiful weather by taking Caden-3yr and Seth-1yr to a park. Caden-3yr is athletic and fearless, and as his antics on the playground equipment got more ambitious, Mike and I stayed closer, ready to catch him. 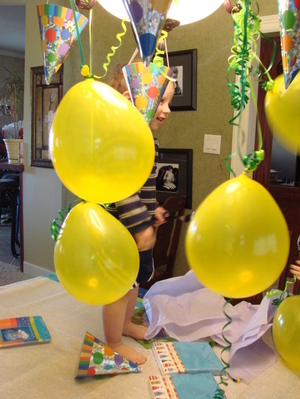 When he’d had enough of our hovering, he yelled, "back UP! I CAN DO ANYTHING!" Just now Caden-3yr and Seth-1yr were fighting over a toy. Again. The same toy they’ve been arguing over ALL morning. I started to intervene when Caden-3yr said, "Stop, Mom. Just stop." He held up a hand for emphasis before continuing. "We are making peace." Making peace?! Where did he hear that? And really, that is NOT what they were making or I would have happily stayed out of it. ‘We are making a really loud ruckus while we fight over this yellow, obnoxious singing animal train that neither one of us usually cares a whit for’ would have been closer to the truth, but I love that he came up with it. Yesterday i went into a rather upscale women’s clothing shop I’ve had my eye on. I don’t usually do that, but a friend said it was worth going to look at, so I did. And! I walked in and a lovely woman greeted me at the door with the words, "Can I get you a Diet Coke?" My whole face lit up. You might have stores like that where you live, but there usually aren’t places like that here. Can I get you a Diet Coke?! Angels began singing and the lady reappeared with a diet coke IN A GLASS. Really. And when I got to the beautiful, luxurious dressing room 45 minutes later? There was ANOTHER diet coke awaiting me. Later I told Mike all about this and Caden-3yr picked up on the key detail right away. "Diet Coke doesn’t go in glasses. At our house Diet Coke does NOT go in glasses." And he’s right of course. But OH! THere is a store here where it arrives, unbidden, and in a glass at that! Caden-3yr, just saying’ it like it is. And whoever of you guys yesterday thought it would be funny to nominate me for Hottest Mommy Blogger somewhere that I will not name or link to – um… yeah. You made me laugh, so thank you. My trainer is fantastic. I refer to her as Workout Barbie, because, well, duh. Workout Barbie decided I should do a lunge type move with my front foot on the floor and my back foot on a step. No problem right? It’s a small step. I have nothing in my hands. I have loads of ballet behind me, and remember? I’m graceful, or at least still under that delusion at this point in time. So Workout Barbie tells me I need to scoot my front foot up further, widening my lunge. Ok. I can do that. So with my back foot still on that step, I scoot. And then WILD FLAILING ENSUES. I have NO idea why i didn’t just, yaknow, move that back foot safely to the ground and start over, because in hindsight that woulda been SO much better. Instead, I flail my arms in circles wildly, jutting out one hip and then the other and almost completely fall over in a pile. Because I brilliantly flail until Workout Barbie moves closer to rescue me and one of my wild swinging arms manages to latch on to her and I am steadied. Safe. I just wish I had managed to not grab her left breast in a deathgrip. Or just fallen to the floor. Really, anything but accidental groping would have been better. We bugged our eyes out at each other, and bent over snorting and laughing and gasping. I have no idea who was more horrified by this. So. Now she knows I"m not all that graceful, and so do I. It wasn’t a fluke. I managed to pop myself in the head with a ten pound dumbell today THREE times. I don’t think that did a thing for my triceps, but whatever. Saturday morning I showed up at the gym for the class that is always packed. It’s aerobics through really fun dance. Or so it’s supposed to be. Workout Barbie was in there, and we’d agreed to meet and ‘have fun!’ together. Ha. Workout Barbie looked great, and had fun. I showed up, and did my very best to keep up with the instructor. He was wonderful. Fun, humorous, explained things well, and he wore camoflauge pants and a big gold belt buckle. He was cool enough (and then some) to pull the look off. It was a full hour of me being the least coordinated, most awful participant in a VERY packed and of course – MIRRORED – room. I tried to have a good time and keep up and get some good cardio in. I did not flee the room, but that is the only thing I think I did right, and do not underestimate that accomplishment. I’m quite proud of it. I did not flee. And for the rest of the world that was there that day? WOW! You go! WHo knew that so many people could show up to a class (where the dances were ‘all NEW’ that day, so no one had an edge of any sort), and they’d just all catch on and do so well?! I was impressed. And humbled. PS COngraulations again to Grim Reality Girl! You will be receiving a darling black New Balance bag with a pink breast cancer awareness ribbon on the front of it. And we have a winner! (not a prize – yet – but I’m working on it!) I’ve been out of town, and just got back and after extra-careful-totally-unscientific-but-wholly-fair number picking….. Grim Reality Girl gets the Grownup Award! Yea!! Even my real life friend Jerri’s numerous (innocent) comments did not tamper with the winner selection process. Drawing to be held Friday night, so get your BSE done before then! I have no idea what the prize is this month, but it’ll be cute. And a Party Dude, who doesn’t normally have the privilege of table dancing, but it was his brother’s birthday, so what the hey? Yes, ladies, it IS the 17th already! So, what does that mean again? It means you go do your self breast exam (if you haven’t done one since last month), then you check back in here and say you did! For your trouble, you receive peace of mind, a sense of health awareness (sounds like a lame phrase, but it’s a good concept), and a bloggy button that is SO cute if don’t already have one. If you do leave an "I did it" comment, you receive an entry into the prize drawing. Why wouldn’t ya? Need to know how or why you’d do this, or what a ‘button’ is? No problem. 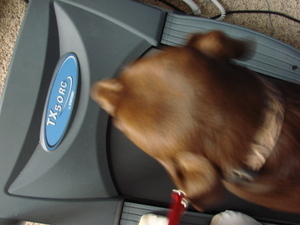 Check here for everything having to do with Club 17.
managed to photograph Duke the dog on the treadmill. very blurry. will post soon but camera is in other room and my feet are cold. photographed purse. decided the beautiful silk striped lining within is more like ‘handbag lingerie’ than lining. stop one child from using my scarf as a Tarzan vine (entwined in blades of ceiling fan). used my excellent Mom Timing, walking in just before the leap from the bed. untangle scarf from fan. which was still ON, although not moving due to entanglement. 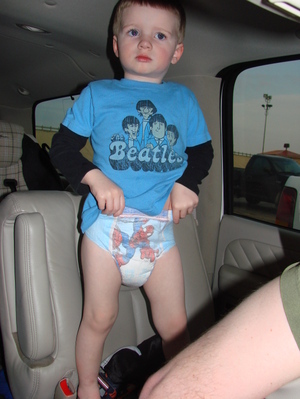 realize later child was indeed being Tarzan, as i’d somehow failed to notice that he was oddly only wearing underwear. found time to read Split Ends by Kristin Billerbeck. Loooove her! look for Ethan-6yr’s lost report card for an hour, to no avail. Funny, but I really, really LOVE my life! Here’s to all of you out there doing the same kinda things. You rock. Update: Just found out a friend is in labor. How exciting in a sooooo-glad-it’s-not-me kinda way! Naaah. You didn’t really think I’d be giving a domestically geared tip for all those Easter eggs, didya? nah. These are bloggy leftovers, written on Easter. 1. I’ve been out of town, having gone to see Kim-12yr. Turns out all my panic and stress beforehand were unnecessary – for once – as the visit went surprisingly well. 2. You know that picture in the last post? And… you know how the top of the page reads “true confessions…?” yeah. Well. I know I look cute in that picture. There. I said it. HELLO? That’s why that picture is there. Thank you for telling me how cute I am anyway – last week was the sort of week I really needed it. And my eyes DO look a little weird, but I was quite thrilled when that photo turned out looking so darn cute, because you SHOULDA seen the others. Oh my. Well, ok, why not. Here we go. 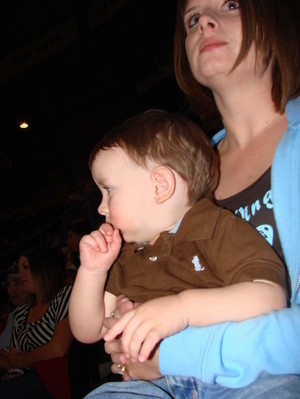 I’m not sure what Seth-1yr is licking off his finger, or what I’m looking at. 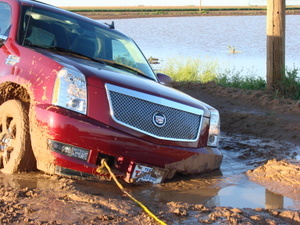 The rodeo is NOT in that direction. That must be my “pretend you don’t know Mike is taking your picture” pose. See the guy across the aisle? Ok. Now look at the black patent leather shoe in the seat behind him. That belonged to a young lady who appeared to be drinking for the first time, and not doing it well. (Duuuude. Been there.) She kept rubbing her foot on his arm, which would cause him to turn around – and as cowboys sometimes do – gallantly apologize to a pretty lady for something SHE did. Now. Repeat this. And repeat this. Add in where the cowboy’s wife gets annoyed with the whole scene, and neither the cowboy or the drinking rodeo-goer in black heels notices. 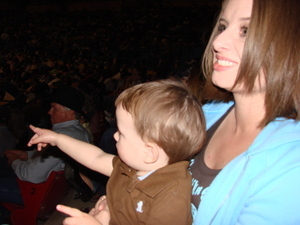 Just the weird lady across the aisle with a mile long neck, unbelievably fake aloofness, cute kid who has to POINT OUT to his silly mother in which direction the rodeo actually is taking place. 3. Hey! Heather gave me the heads-up on this!! Very cool to get an award for blogging for God. Humbling, since I’m usually chronicling poop. Congratulations to Heather as well! I can’t get the button to work for some reason, so I’m posting it here. Isn’t it cute? Thanks to Mother’s Day Central for the award! 4. I’m not ready to blog this, since the mud has barely dried and my sense of humor is not quite ready to regale you with how it happened. (kinda my fault in a biiiiig way)But. A big thank you to Mike and his dear friend who came to rescue me. It took hours, a lot of work, a lot of trouble on their part, and a lot of gratitude on mine. So, in case Mike and his dear friend see this, THANK YOU. I intend to post eventually and your truly heroic acts will be properly recounted. 5. 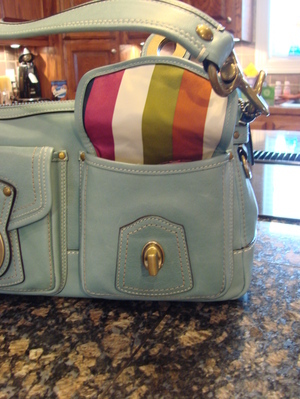 I bought a purse. 6. Number 5 is super significant, and I’d like to tell you all about it, and I think I will, but not yet. I need to first decide that hate mail is ok, and hey… who cares? I bought a cute pair of shoes once, DID NOT mention price, and my inbox filled with hate mail from readers who incorrectly assumed my shoe purchase somehow took away from my family or their family or the world at large. 7. Why not just shut up about the purse and never bring it up in the first place…? 8. Because. I was trying to explain it to my mom on the phone earlier and the words that came out of my mouth – although stupid – were “Mom. We walked into the store and THERE. IT. WAS. It was just… on the wall. If that purse had had eyes, our gazes would have locked. 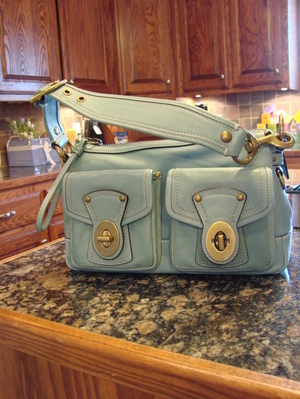 And that was it.” No other purse in the store really mattered after that love at first sight, totally unexpected moment. No accessory has ever captured my heart as fully as that bag did at that moment in time. NOT EVEN A SHOE. Really. 9. So how could I NOT tell you guys? Of course I will, even at the risk of certain hate mail. Y’all are special to me that way. Actually, I think i pretty much just DID tell you about it. Picture forthcoming of course. 11. I’m behind on my email. All of you Total Transformation parents, hang in there! You’re doing great, and there IS life on the other side of this crisis parenting thing. 13. Y’all are really, really the best. Thank you. 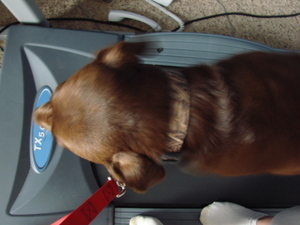 I would gladly share photos of Duke on the treadmill, as so many of you have sweetly requested… but he’s been benched. The vet confirmed Mike’s suspicion that he has a sprain and he’s officially off treadmill privileges for awhile. And just so we’re clear, NO, the treadmill is not the reason for the injury. It’s perfectly safe. What is NOT perfectly safe is Duke’s method of going down the stairs that lead to our basement. He’s quite afraid of stairs. When we first got him, he had to be forced to go near them. Now, he just gets it over with as fast as possible. That may work well for taking bad tasting medicine, but for stairs? Not so safe. 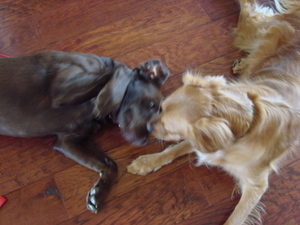 He’s a big chocolate lab, and his method involves flinging himself off the top stair, stays airborne at least 3/4 of the way down, then tumbles down and smashes into the wall at the bottom. In his mind, this is far less scary than just walking down the stairs, but I don’t see how. Anyway. He sprained something. Go figure. I suppose if I can get a dog to workout on a treadmill, teaching him to walk on stairs might be next. 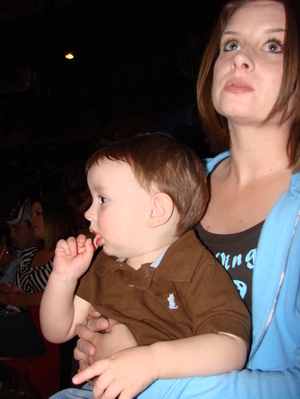 But since you wanted pictures, here is one from last weekend’s rodeo. Wow. My eyes look sort of scary in a drugged sort of way. huh.